Two years ago, StogieGuys.com broke the news that, for the first time since 1977, long-filler cigar tobacco was being grown in Florida. Jeff Borysiewicz, owner of the Orlando-area Corona Cigar stores and a partner in the Sindicato cigar company, began growing tobacco on land he had purchased—out of love of the leaf, and to avoid paying residential taxes on the land, which is outside Orlando. At the time, while we learned Drew Estate had been selected as Borysiewicz’s partner in the endeavor, it was unclear exactly how the tobacco would be used. About a month ago, we learned it has been included in a new blend from Drew Estate aptly called Florida Sun Grown (FSG). The Floridian tobacco joins Nicaraguan leaves as a component of the filler; the binder is Mexican and the wrapper Brazilian. 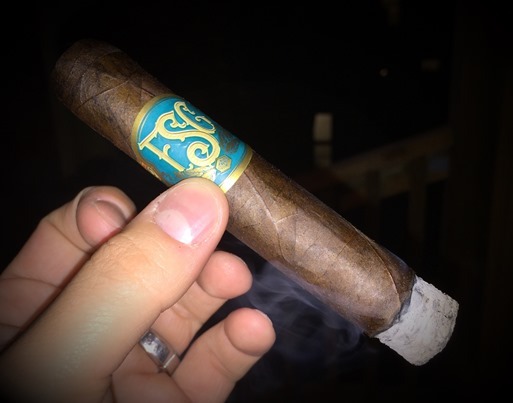 FSG was blended by Drew Estate Master Blender Willy Herrera over the course of two years. Five vitolas—including a Limited Edition Trunk-Pressed Toro (6 x 54)—currently retail in the $11.50-$15 range. For now, they are only available at Corona Cigar stores, or at Corona Cigar’s retail website. However, rumor has it Borysiewicz would like to see FSG go national. If that happens, the exclusivity at Corona Cigar will likely be remembered as a soft launch. The FSG Robusto (5 x 54) is a dark, firm, oily cigar with a cross-section of tightly packed tobaccos visible at the foot and hearty pre-light notes of raisin and musty earth. It is adorned by a handsome band of teal, orange, and gold that interestingly makes no mention of Drew Estate. The cold draw is smooth and easy. The flavor is full-bodied and spicy right from the get-go with tons of espresso, black pepper, cayenne heat, and roasted nuts. There’s some raisin and black cherry to help add balance, though that background sweetness certainly doesn’t diminish the intensity. The texture is thick and leathery. After about an inch, the Robusto settles down a bit, but never recedes below the medium- to full-bodied range. Some creaminess enters the equation, as does a little citrus and oak. The final third displays a powerful combination of roasted notes, char, meatiness, and spice. The combustion qualities are exactly what I’ve come to expect from La Gran Fabrica Drew Estate. The white, finely layered ash holds well off the foot, the draw is clear, the smoke production above average, and the burn line stays straight from light to nub. It will be interesting to watch the progression of Borysiewicz’s foray into premium cigar tobacco cultivation in Florida. Will FSG get a national release? Will a Florida-grown wrapper leaf be introduced? Will the entire venture be killed off by FDA regulation? I will continue to observe with keen interest. For now, I can say the Florida Sun Grown Robusto is a bold, interesting experience, even at the considerable price of $11.50. In my eyes, this particular cigar is worthy of a very admirable rating of four stogies out of five. Well done! Love this one as well!